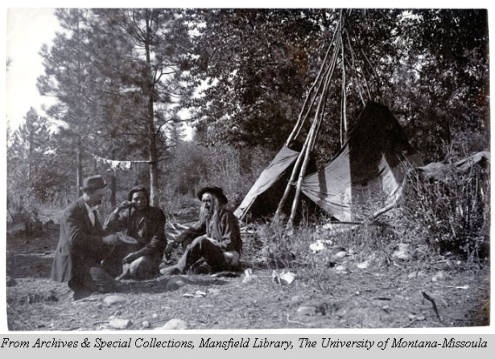 The follow photographs were compiled by Ellie Long of the Clark Fork Coalition. They are a fascinating sampling of life in the Rattlesnake from many years ago. Enjoy them and feel free to post comments or send us some old photos you have. We’d love to share them. 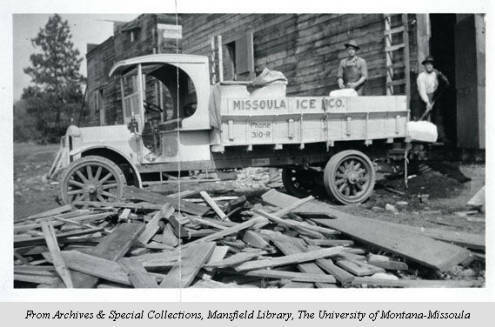 In 1860 Rattlesnake Creek powered a sawmill called Missoula Mill. 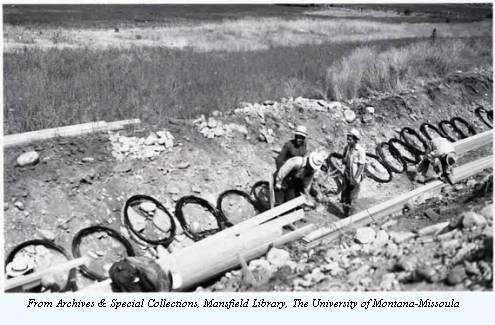 A ditch was constructed to divert water from the creek to the sawmill, located on the north bank of the Clark Fork, near where the Higgins St. Bridge is located today. 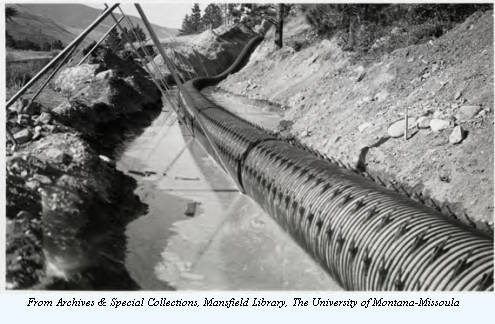 This ditch provided the main water supply for the city of Missoula. In 1871 or 71, Frank Worden and Company began construction of a water system that diverted water from Rattlesnake Creek about 3.5 miles north of town through a system of wooden pipes into a smaller reservoir on what is now Water Works Hill. The first known permanent white settler in the drainage was Bill Hamilton who settled near the mouth of the Rattlesnake Creek in 1858 and operated a trading post until 1864. 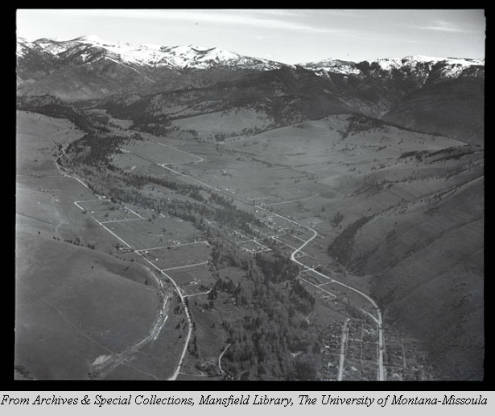 By 1890, the upper Rattlesnake drainage (north of Mountain Water Co. dam) had 12 residents. The population of the upper drainage skyrocketed and peaked at 139 people by 1910. In the Early 1900’s, there were as many as 19 homes in the upper Rattlesnake with amenities such as mail and newspaper delivery. In 1911, there was a phone line that ran up to the Franklin Guard station and up over the ridge to Gold Creek. A school was built near the confluence of Spring Creek and Rattlesnake Creek and operated from 1907 to 1930. The population had declined to 44 inhabitants by 1930. The Upper and Lower Rattlesnake drainage was the site of considerable logging activity that accompanied the construction of the Northern Pacific Railroad. Thomas L. Greenough, a local businessman, contracted with the Northern Pacific Railroad to furnish times for construction of the rail bed 40 miles east and west from Missoula. He logged from unsurveyed public lands and unclaimed lands up Rattlesnake Creek. His crews cleared out logjams and other obstructions along the banks and floated the ties or logs down the creek. 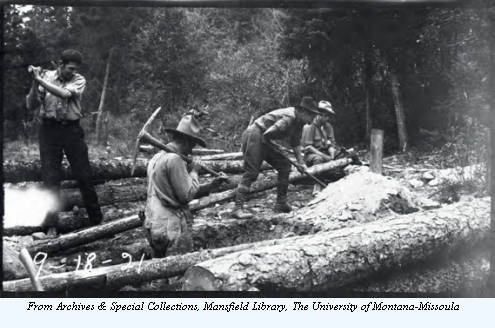 Tie hackers used broad axes to square the logs so they could be laid in the rail bed. Wood that was not suitable for ties was cut into cordwood, which during the winter, was hauled by sleigh to the stream bank for floating in the spring. 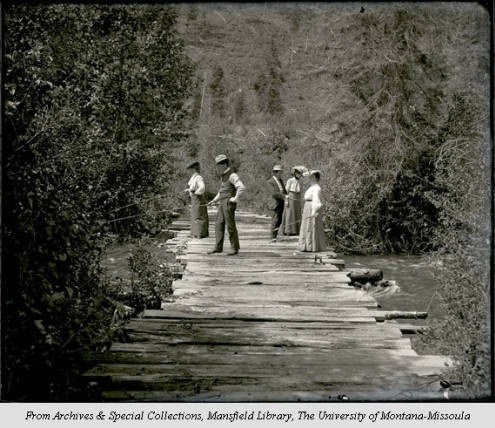 Crews cut timber for four to five years until sometime between 1885 and 1887. During this time, Greenough cut an estimated 20,000 ties and large amounts of cordwood, In 1884 alone, he floated about 2,500 cords of firewood down the creek. 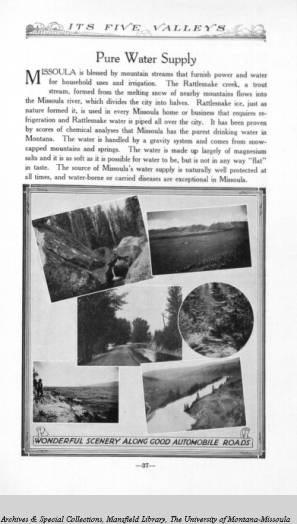 The Mountain Water Power Company built 10 dams on eight lakes in the present day Rattlesnake Wilderness area between 1911 and 1923 to augment the water supply for the City of Missoula. 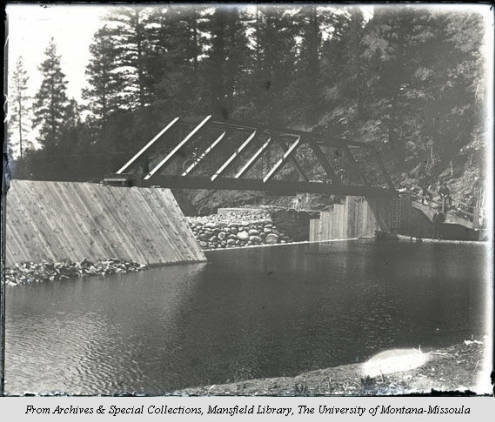 These dams and water rights were sold to Mountain Water Company in 1979 and are still operated and maintained today as a backup water supply for the City of Missoula. By the early 1880’s increasing demands were placed on the Rattlesnake water system and the creek dried up by the fall of 1885. In response, Rattlesnake farmers filed water rights on the High Falls Tributary of Rattlesnake Creek and set about finding other lakes they could tap to sustain flows during summer and fall. Clarence Prescott and John Higgins found several lakes for this purpose and names seven of them. Ditches were dug from some of the lakes to convey water Rattlesnake Creek, increasing the annual amount from 3,000 to 17,000 inches. While the upper Rattlesnake was utilized as the main source of water for the city and for farmers and settlers in the upper valley, the lower Rattlesnake remained largely undeveloped until the arrival of the Northern Pacific Railroad in 1883. Before 1883 the lower Rattlesnake had scattered cabins and commercial enterprises and was considered a slum called Shacktown. Shacktown was housed primarily on the west side of lower Rattlesnake Creek and was largely occupied by Native Americans who sustained themselves by hunting, fishing, trading and doing odd jobs. When construction of homes began in the lower Rattlesnake in the 1880’s Shacktown was relocated to Parker’s Island in the Clark Fork River. The Salish Indians reported to have named the stream “Kehi-oo-le”, meaning Rattlesnake. Despite popular belief that the name comes from rattlesnakes living in the area, it actually was named that because during high water the creek sounded like the rattle on a rattlesnake. Captain Meriwether Lewis noted it as “ a stream about 15 yards wide” on July 4th 1806.